What's Next: Rupert Murdoch will host a dinner for Saudi Crown Prince Mohammed bin Salman at his estate in Bel Air on Monday night, sources here in Hollywood tell me. 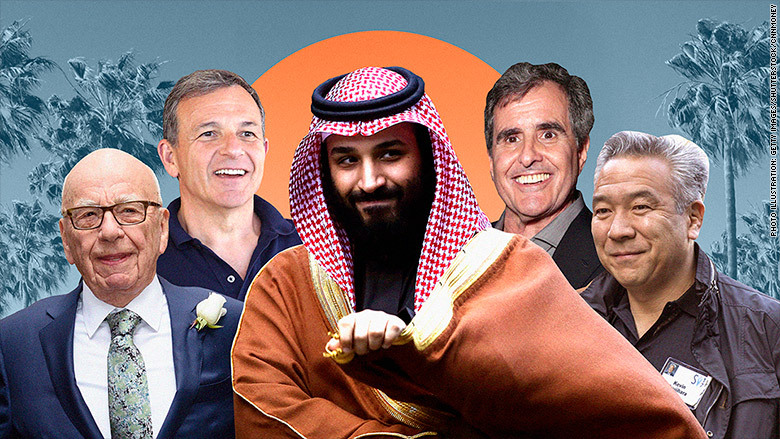 The guest list includes Disney CEO Bob Iger, Warner Bros. Chairman Kevin Tsujihara, 21st Century Fox President Peter Rice and media investor Peter Chernin. The Big Picture: The 32-year-old prince is courting American business leaders and investors as part of his effort to modernize Saudi Arabia's economy. His West Coast swing also includes meetings with Jeff Bezos in Seattle and Tim Cook in Silicon Valley. Facebook's latest headache is the publication of a 2016 memo from Vice President Andrew "Boz" Bosworth defending the company's aggressive growth strategy and data collection practices -- even if it means that some people get bullied or killed. • "We connect people. ... That can be good if they make it positive. Maybe someone finds love. Maybe it even saves the life of someone on the brink of suicide. • "So we connect more people. ... That can be bad if they make it negative. Maybe it costs a life by exposing someone to bullies. Maybe someone dies in a terrorist attack coordinated on our tools." • "And still we connect people. ... The ugly truth is that we believe in connecting people so deeply that anything that allows us to connect more people more often is *de facto* good." • "That's why all the work we do in growth is justified. All the questionable contact importing practices. All the subtle language that helps people stay searchable by friends. All of the work we do to bring more communication in. The work we will likely have to do in China some day. All of it." • "The Bosworth memo reveals the extent to which Facebook's leadership understood the physical and social risks the platform's products carried — even as the company downplayed those risks in public." • "It suggests that senior executives had deep qualms about conduct that they are now seeking to defend." • "As the company reels amid a scandal over improper outside data collection on its users, the memo shows that one senior executive — one of Zuckerberg's longest-serving deputies — prioritized all-encompassing growth over all else, a view that has led to questionable data collection and manipulative treatment of its users." • "I don't agree with the post today and I didn't agree with it even when I wrote it. The purpose of this post, like many others I have written internally, was to bring to the surface issues I felt deserved more discussion with the broader company." • "We've never believed the ends justify the means. We recognize that connecting people isn't enough by itself. We also need to work to bring people closer together. We changed our whole mission and company focus to reflect this last year." Elon Musk's latest headache is a recall of about 123,000 Model S sedans after the company observed "excessive corrosion" of power steering bolts in some cold climates. • "The recall comes at a rough time for Tesla. Its stock price has plunged more than 25% over the past month." • "Investors are worried about the startup's ability to deliver on its first mass-market car, the Model 3, which has been plagued by manufacturing woes." • "The Model 3's introduction been mired in glitches and delays..."
• "Tesla's driverless efforts have been overshadowed..."
• "The company has continued to lose money quarter after quarter..."
What's Next: "Some analysts are asking whether the company could run out of money by the end of the year..."
A California judge's ruling that coffee must now carry a cancer warning because it contains acrylamide. The case is likely to get appealed and, we hope, overturned. If we start putting cancer warnings on coffee, we're going to have to start putting cancer warnings on everything. • "Walmart is in preliminary talks to buy insurer Humana... a deal that would... transform Walmart overnight into one of the nation's largest health insurers." • The Big Picture: "The talks come as health-service providers are rapidly pairing off and retailers—particularly pharmacy chains—are looking to diversify and bulk up in the face of the competitive threat from e-commerce giant Amazon.com." • CVS bought Aetna for $69 billion. • Cigna bought Express Scripts for $54 billion. • Quietly launched its own over-the-counter health products. • Expanded its discounted Prime program to beneficiaries of Medicaid. • Pushed to become a supplier to U.S. hospitals and outpatient clinics. • "The company has fired Akin Gump Strauss Hauer & Field LLP, which is Washington's biggest firm, and has also dumped Squire Patton Boggs." • "Moving forward, Amazon will be represented by Paul Brathwaite of Federal Street Strategies LLC and Josh Holly of Holly Strategies Inc."
The Big Picture, via Bloomberg: "In the past five years, Amazon increased lobbying spending by more than 400%, a rate of change that far exceeds rivals." Talk of Tinseltown: Moonves to get CBS-Viacom? • "CBS is preparing to make an initial merger proposal to Viacom within days... setting the stage for negotiations that could bring the media companies back together 12 years after they were split up." • "CBS... is planning to propose that its chief executive officer and chairman, Leslie Moonves, lead the combined company..."
The Big Picture: We're in an era of consolidation -- AT&T-Time Warner, Disney-Fox, etc. -- and smaller companies need to scale up to stay competitive. The success of ABC's "Roseanne" reboot, which drew a staggering 18 million viewers earlier this week, has Hollywood executives rethinking programming in the Trump era. • "People gather round and they see themselves in this family. It speaks to a large number of people in the country who don't see themselves on television very often." • The same thinking is behind the "American Idol" reboot: "We went after it because that's a show that, fundamentally, is about the American dream. It's about a girl with a cowboy hat and a boy with a banjo and people from small towns where music has saved their lives in different ways." • "It's TV comfort food. The world (White House) is going mad right now and Roseanne is a familiar angry/righteous voice." What's Next: "ABC is set to order a second season." Brian Stelter scoops. Bleeding Blue: What the hell? "Dodgers out of sync offensively in loss to Giants" by True Blue's Eric Stephen. "Brave New World Dept. : Are We Already Living in Virtual Reality?" by Joshua Rothamn in the April 2 issue of The New Yorker: "A new technology—virtual embodiment—challenges our understanding of who and what we are." "Letter from Silicon Valley: At Uber, a New C.E.O. Shifts Gears," by Sheelah Kolhatkar in the April 9 issue of The New Yorker: "Dara Khosrowshahi is charged with turning the scandal-plagued startup into a traditional company—without sacrificing what made it successful." "A People in Limbo, Many Living Entirely on the Water" by Ben Mauk in this Sunday's New York Times Magazine: "Floating villages spread across the surface of the Mekong River's waterways, playing host to ethnic Vietnamese whose status in Cambodian society is perpetually adrift." "Anthony Bourdain's Globalist Mission" by WSJ's Howie Kahn: "With 'Parts Unknown,' now in its 11th season, Bourdain continues a restless odyssey to understand our global community through food." Welcome to Spring. See you Monday.